Patio pavers give your landscaping a solid, put-together appearance, and they perform very well if they're installed correctly. If they're not installed well and properly cared for, however, you may have problems with them. 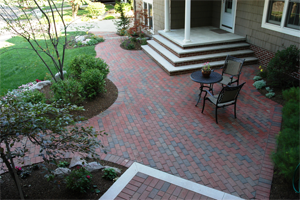 Shifting, cracking,and uneven spaces can all result from improper installation of patio pavers. Fortunately, there are some simple things you can do to take good care of your patio pavers. If you follow this advice, your patio pavers will serve you well for many, many years. 1. Use a concrete slab base. One of the most common problems people have with patio pavers is uneven settling. The ground beneath us shifts with time and with the changing temperatures of the seasons. If you don't do anything to compensate for the ground's inevitable shifting, your pavers will also shift. In the best case scenario, your shifted patio pavers will be uneven and develop gaps, which are tripping hazards. In the worst case scenario, your patio pavers will crack and even crumble. If you lay a concrete slab base beneath your patio pavers, you won't have to worry about uneven settling. A concrete slab base takes care of the settling problem with the concrete managing the uneven ground and allowing your patio pavers to remain in their orginal positions. 2. Seal the pavers after installation. Once your pavers are properly installed over a solid concrete slab, two layers of sealant will prevent water and stain damage. Pavers play a very important role in your landscaping, and keeping them looking good will preserve the overall good looks of your home's exterior. The sealant prevents your pavers from absorbing too much water and attracting moss and fungus, and it also prevents staining from rock salt and spills. To keep your patio pavers looking good, you should re-apply the sealant once a year after the initial installation. This job doesn't take long, but it preserves your patio and keeps it looking new. 3. Keep your patio free of dirt and debris. As the seasons come and go, your patio will experience different sorts of activity. In the summer, it will host parties that will bring foot traffic, food spills, and splashes of water. In the fall, leaves and dried blossoms fall on top of it. In the winter, snow piles up along its edges, and leaves may continue to fall as the wind blows the remnants off the trees. In the spring, new growth may edge its way onto your patio from adjacent lawns and garden beds. Therefore, each season drops debris onto your patio pavers that must be removed to keep the surface uncompromised. Sweep or blow dirt and debris off your pavers, and trim back plants that want to grow onto the pavers' surface. By keeping your pavers free from dirt and debris, you'll not only keep your yard neat and tidy, but you'll extend your patio's life. 4. Remove furniture and mats from your patio during the winter. You won't be lounging about the patio in the winter snow and wind, so remove your outdoor furniture and mats for the season. You'll keep your furniture looking better by storing it during the harsh winter months, and you'll prevent unnecessary wear and tear on your patio pavers. It doesn't take much to keep your patio pavers looking new, but it does require a little attention. If you have a tendency to forget seasonal chores such as re-sealing your patio or storing your outdoor furniture, make a recurring appointment in your electronic calendar to remind yourself of these chores. A little attention goes along way with patio pavers.